MIM: The list of speakers at the Al Hewar Center shows that Thomas's prefacing an address at the center with the words"My Fellow Terrorists" may be her only accurate accessment in her 57 years as a political commentator. The Al Hewar Center's claim that they are not "affiliated with any organisation, nation and ideology " could not be further debunked then by the names on the list below which reads like a Who's Who of radical Islamists, institutions, and organisations. Abboud Edward Author of "Invisible Enemy: Israel, Politics, Media, and American Culture"
Chief Representative of the PLO in Washington D.C.
Bohn Michael K. Author of "The Achille Lauro Hijacking: Lessons in the Politics and Prejudice of Terrorism"
Bureau Chief of MBC TV in Washington D.C. Professor of Sociology at American University in Washington D.C.
Egyptian professor in Washington D.C.
Jarrah Samar Journalist, Teacher, Peace Advocate, and author of "Arab Voices Speak to American Hearts"
Murphy Caryle Pulitzer Prize winning Washington Post reporter and author of "Passion for Islam: Shaping the Modern Middle East: The Egyptian Experience"
Visiting scholar from Sana'a University to American University in Washington, D.C.
MIM: The Al Hewar Institute's Islamist agenda is highlighted by this Universal Islamist Declaration of Human Rights, which is meant to replace the Constitution with the Koran when the Khalifate is implemented world wide. The declaration, proclaims that "Islam gave to mankind an ideal code of human rights fourteen centuries ago" and that this is "a declaration for all mankind"
b) Every individual and every people has the inalienable right to freedom in all its forms¾ physical, cultural, economic and political — and shall be entitled to struggle by all available means against any infringement or abrogation of this right; and every oppressed individual or people has a legitimate claim to the support of other individuals and/or peoples in such a struggle. 12/7/99: Panel discussion about "The Arab Nationalist Movement in the 1950's and the Islamic Awakening in the 1980's: Remarks and Conclusions," featuring Dr. Taha Jaber Alalwani, Dr. Clovis Maksoud, and Mr. Sadek Sulaiman with remarks by Chief Representative of the Arab League Dr. Khalid Abdulla (in Arabic). 12/1/99: A conversation with former Lebanese Ambassador Dr. Mohamad Chatah about "The Lebanese Economy - Now and in the Future" (in Arabic). 11/17/99: A conversation with Dr. Nasr Aref, professor of political science from Cairo University, about "The Freedom of Thought in the Muslim World" (in Arabic). 11/14/99: A conversation with Mr. Mohammed Abu-Ali, financial advisor with Morgan Stanley Dean Witter, about "Investing with Ease: Will You Achieve Your Financial Dreams?" (Presentation and Discussion in English and Arabic). 10/22/99: Discussion with Dr. Mona Abul-Fadl, Chair of Women's Studies at the Graduate School of Islamic and Social Sciences (GSISS), about "Tradition and the Contemporary Arab Woman" (in Arabic). Followed by an open discussion with Six Members of The Legal Committee of the Palestinian Legislative Council (a special project sponsored by the West Bank/Gaza Mission of USAID). 10/19/99: - A conversation with Dr. Taghreed Aqudsi, professor of Library and Information Systems at the Kuwait University and visiting professor at the University of Maryland, about "Literature for Arab Children and Young Adults." Followed by an open discussion with Syrian thinker, Dr. George Jabbour, about "The Three Initiatives Needed to Serve Arab Civilization" (both events in Arabic). 10/12/99: - A conversation about "What The Community Wants from Arab and Muslim Organizations" with Dr. Hala Maksoud, President of the American-Arab Anti-Discrimination Committee (ADC) and Mr. Aly Ramadan Abouzakouk, Executive Director of the American Muslim Council (AMC) (in Arabic). 9/29/99: Panel Discussion about "Arab Solidarity During Gamal Abdul Nasser's Era" (in Arabic). 9/22/99: Panel Discussion about "How to Approach the Issue of Jerusalem with Americans" (in English and Arabic), featuring Khalid Turaani, director of American Muslims for Jerusalem, and Khalid El-Gindi, from the American Committee for Jerusalem. 9/17/99: An evening of poetry with Dr. Anis Obeid reading from his new book of poetry "Sada Assineen (The Echo of the Years)" (in Arabic). 9/1/99: "A Point-of-View About the Upcoming Presidential Election in Yemen" with Mr. Mohammad Ghaleb Ahmad, a representative of the Social party (in Arabic). 8/30/99: Special event organized in coordination with ANA TV about "The U.S.-Arab Community: What it Means to Come from Different Countries with a Single Culture to One Country with Numerous Cultures" (in Arabic). Broadcast live on ANA TV with a studio audience and call-in participation on Abbas Metwalli's show. 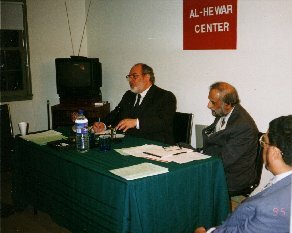 8/4/99: Open Discussion on "Expectations about the Middle East Peace Process", including opinions by Palestinian writer, Dr. Fowzi Al-Asmar, Saudi writer Dr. Anwar Al-Ashqi, and Egyptian writer Dr. Hassan Wajih. Moderated by Chief Representative of the Arab League Dr. Khalid Abdulla (in Arabic). 4/18/99: Young Adult Meeting (for ages 20s & 30s), followed by a conversation with political science professor and media expert, Dr. Edmund Ghareeb, about "The Technology Revolution and its Effects on the Arab Media" (English and Arabic). Followed by a Screening of "Nahr el-Hayat," a short film produced, directed and performed by Arab Americans in Washington, D.C.
3/8/99: Open Informal gathering for members to get acquainted. 3/1/99: Open Informal gathering for members to get acquainted.